Is ‘Cruelty-Free Cheese’ an Oxymoron? Attitudes about animal rights and welfare often shape dietary choices. At one end of the spectrum are strict vegans who eschew foods containing any animal products. At the other end are unapologetic meat-eaters who flinch not even at the prospect of eating veal from calves separated from their mothers at birth, confined for months within tiny crates designed to prevent all exercise and foster tender “gourmet” meat, and fed an iron-deficient milk substitute to induce anemia and pale-looking flesh. In the middle perhaps are ovo-lacto vegetarians who allow eggs, cheese and other milk products, but no meat. Vegetarianism is on the rise in America. According to a 2008 survey published by Vegetarian Times magazine, 3.2 percent of adults follow a vegetarian diet and another 10 percent follow a vegetarian-inclined diet. Even among meat-eaters, five percent said they were “definitely interested” in switching to a vegetarian diet in the future. Of the reasons vegetarians gave for their choice of diet, animal welfare was mentioned most often, so it’s a safe assumption that vegetarians are often compelled by a belief that no animals suffered or died for the animal products they consume. But is this really possible? For eggs, this myth has already been debunked as the brutal conditions inherent to factory farming have come to light, with practices like the debeaking and crowding of laying hens into wire cages so small they can’t extend their wings, or tossing live male hatchlings into trash bags or grinding machines because they are of no value to egg production. Eggs labeled “cage free” or even “free-range” offer no assurance that the chickens ever experienced the out of doors. A look into the nuts and bolts of cheesemaking reveals that truly suffering-free cheese is also tough, if not impossible, to come by. The devil is in the details. In a nutshell, cheese is the product of coagulating (curdling) the milk protein casein. The milk is first acidified by addition of vinegar, or more often bacteria, to convert the sugars into the lactic acid needed to form the softer curds characteristic of fresh cheeses like cottage or cream cheese. More rubbery, lower-moisture, aged cheeses, like Swiss or cheddar, require addition of enzymes to achieve the desired taste and texture. Can any milk product be made without animal suffering? The problem for sympathetic vegetarians begins with the sourcing of milk. 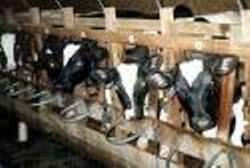 In factory farming dairies, milk cows live unnatural lives, typically dosed with bovine growth hormone (BGH) to push up milk production to 70 pounds per day or more: BGH promotes mastitis, a painful inflammation of the udder. Routine dosing with antibiotics is also commonplace to compensate for the spread of diseases fostered by the filthy conditions cows endure on giant, crowded feedlots. The day-to-day treatment of cows would appear at first glance better in organic dairy operations, in part because BGH and the prophylactic use of antibiotics are prohibited (the latter implying that the living conditions need be more sanitary). Furthermore, new organic standards dictate that, weather permitting, ruminants have access to pasture at least a third of the year and derive, at minimum, 30 percent of their sustenance from grazing. Spokesperson Kayla Koenings of Organic Valley, the nation’s largest producer of organic milk, said their milk cows are generally allowed to live a few years longer than those on factory farms but are still slaughtered for beef well before the end of their natural lives. A spokesperson for Horizon Organic, another major producer of organic dairy products, confirmed the same. However, organic or not, there is still the sticky issue of what happens to male calves which are of no use to dairy operations. 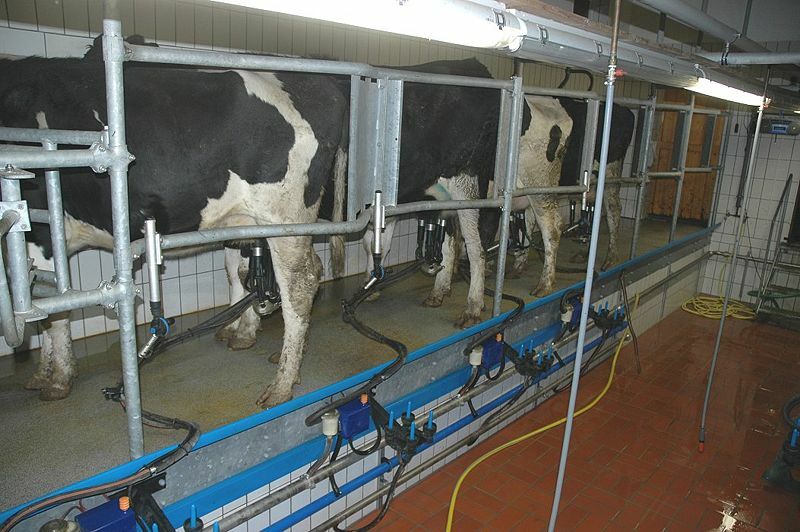 Milk cows have to be re-impregnated about once a year to maintain milk production, and obviously only the female calves have value as replacement milk cows. So even though vegetarians do not eat veal or beef, any milk products they do consume are directly linked to the fate of male calves. In factory farms, male calves are slated for veal production or, if ‘lucky,’ castrated without painkillers, fattened to maturity in muddy feedlots and slaughtered in a barbaric process that, according to a 2001 Washington Post exposé, allows some to be dismembered and skinned while still conscious. Veal calves are slaughtered by the same process.Within an organic dairy cooperative like Organic Valley, the preference is to rear the male calves within the cooperative of organic farms until they are mature and ready for slaughter, but spokesperson Koenings admitted there is no guarantee that male calves are not sold outside the cooperative for veal. The same holds true for Horizon Organic farms. As awareness of the treatment of veal calves has spread among the American public, per capita veal consumption has dropped over 90 percent from a peak of 3.5 pounds in 1975 to 0.3 pounds in 2008, according to U.S. Department of Agriculture statistics. Cheese consumption, by contrast, more than doubled over this same period, exceeding 30 pounds per capita in 2008. The crating of veal calves has been banned in both the United Kingdom and the European Union. A plan to voluntarily phase out this practice in the United States by 2017 was announced by the American Veal Association in 2007. PETA’s take on organic diary farms is that cows are sometimes subject to even more cruelty than on conventional farms. Spokesperson Bruce Friedrich points out that the prohibited use of antibiotics creates pressure to withhold medication which would ease the pain of mastitis and other infections. He also claims that the tighter profit margin under which organic farms often operate means animals that are sick or in pain are often kept around to suffer longer than on conventional farms. Cheesemaking is thought to predate recorded history, and by Roman times cheeses were a dietary staple in some parts of the world. 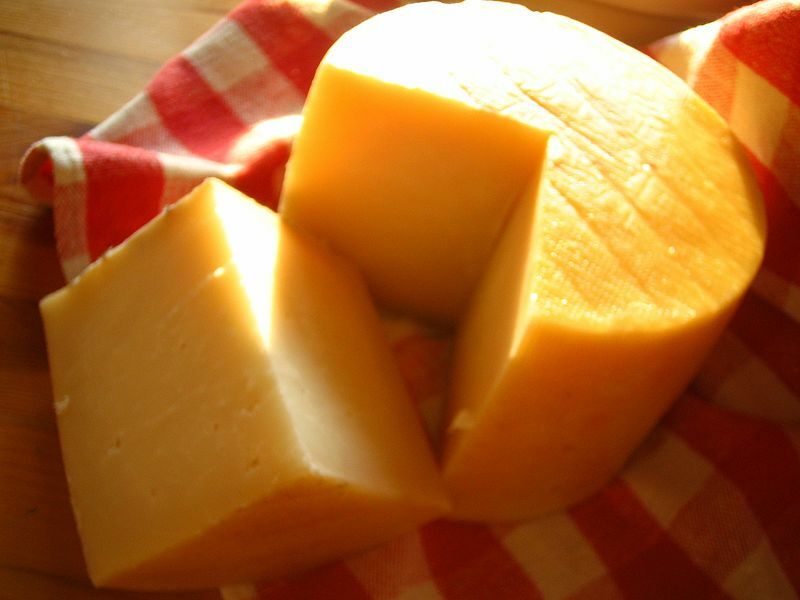 Up until 1980s, the enzymes used in aged cheeses were derived entirely from the stomach lining of very young calves. While still milk-fed, their stomachs produce ample amounts of the enzyme chymosin (aka rennin) which performs optimally in aging cheese. In fact, it is posited that cheesemaking may have been discovered a few thousand years B.C. when milk was stored in the inflated stomachs of animals commonly used as food storage vessels. But, as grass is introduced into a calf’s diet, chymosin production wanes in favor of pepsin, so the calf is slaughtered while very young to extract calf rennet, the optimal enzyme balance. In the United States, only three percent of cheese produced is still made with calf rennet, according to Mark Johnson, a cheese expert from the Wisconsin Center for Dairy Research (WCDR). In Europe, the percentage remains higher, largely because of so-called artisan cheeses made according to recipes handed down for centuries. All of the animal welfare issues that have come to light with respect to veal production apply equally to cheeses made with calf rennet because the rennet and veal are two sides of the same industry. For the other 97 percent of U.S. cheeses, milk coagulation is accomplished instead with enzymes from one of two microbial sources, one of which is a GMO organism (genetically modified). Volatility in the pricing and availability of animal rennet was the impetus for the discovery of microbial alternatives. The non-GMO source is called microbial rennet and is obtained through fermentation of a fungus, usually mucor miehei, which produces enzymes similar, but not identical, to calf rennet. Fifteen percent of cheeses today are based on microbial rennet. Some experts, like Wolfgang Pachschwöll, an Austrian maker of the calf rennet brand BioRen, contend that calf rennet is both a more effective coagulant and produces superior aged cheeses. He also claims that animal derivatives (like meat broth and gelatin) are sometimes added to the fungus-growing medium, so that people seeking a cheese for which no animal was sacrificed along the way can be misled by the microbial rennet designation. Mark Johnson of the WCDR said cheesemakers generally consider the details of fermentation proprietary information not shared with the public, but he confirmed that some protein source is a necessity. However, a spokesperson for a U.S. company that sells microbial rennet under the label Hannilase shared that no animal derivatives are used in their fermentation process and that such a practice, though perhaps once standard, would not be applicable to cheeses sold in the United States today because of Kosher requirements. Rabbi Zushe Blech of New York State, a recognized expert of modern Kosher food production, said he could testify to this fact because he has personally Kosher-certified all makers of microbial rennet across the globe (of which there are just a handful). The GMO microbial enzyme alternative is most accurately identified as fermentation-produced chymosin or FPC because it is derived from bacteria, yeast or mold engineered to produce chymosin identical to the calf’s by insertion of the calf gene for chymosin into the organism’s genome. The organism is removed from the final product which is essentially pure chymosin, so it is controversial whether or not it is technically a GMO product. FPC is now the most widely used milk coagulant today, accounting for 82% of U.S. cheeses. In addition, there exist “vegetable coagulants” from plants, like cardoon thistle, but the enzyme yield is low compared to the calf and microbial types and there is apparently no commercial source, though some cheeses in Europe are purported to be made with them. Whenever enzyme coagulants are employed in cheesemaking, the label ingredients will list “enzymes,” but it is the exception that the source – animal or microbial – is identified, and the label will not specify when the microbial organism was GMO. Muddying this issue even further for vegetarians is the fact that some cheeses, like blue cheese, Romano and Provolone, are often aged also with lipase enzymes which break up fats and allow a stronger flavor to develop. Lipases also appear on labels simply as “enzymes” and carry the same animal welfare baggage as calf rennet because they are derived from throat glands of calves or lambs. Lest one not feel left shopping totally in the dark when selecting a cheese, below are some animal welfare facts that can be gleaned from labels. The manufacturer’s website sometimes provides more detailed information, and for other still unanswered questions calling the manufacturer and asking to speak to someone in the know might yield results. USDA Organic: Implies cows allowed access to pasture and not treated with hormones or antibiotics. Calf rennet, animal lipases and microbial rennet are all allowed (but never FPC), though some brands use no calf rennet in any cheeses. Male calves born on some organic farms might be less likely to be slaughtered for veal. Kosher: If made in the United States, cheeses will not contain any animal enzymes, though both FPC and microbial rennet are permitted. Kosher European cheeses might be made with calf rennet and/or lipase where the animal has been slaughtered according to Kosher specifications (throat and trachea of a fully conscious animal are slit and the animal is bled out). Milk from factory-farmed cows is permitted. Halal: When animal enzymes are used, calves must be killed according to Islamic rules in a certified slaughterhouse (similar to Kosher). FPC, microbial rennet and milk from factory-farmed cows are all allowed. Soy, Almond and Rice Cheeses: Most contain a milk protein (casein) which, unless labeled organic, could derive from factory-farmed cows. Vegan: Contain no animal derivatives whatsoever. Imported: Specialty cheeses from Europe still often use calf rennet and/or lipase. FPC is not used in cheeses made for sale in those parts of Europe that ban GMO products, but it is allowed in European cheeses sold in the United States. BGH is banned in the Europe Union and Canada. This entry was posted on Friday, March 4th, 2011 at 7:15 am and is filed under diet, health, science, sustainable living. You can follow any responses to this entry through the RSS 2.0 feed. You can leave a response, or trackback from your own site. 9 Responses to Cruelty-Free Cheese? I am astounded by the amount of information in this article. After reading it, I am grateful that my lactose intolerance precludes any milk slurping or cheese chomping. I knew this industry was most often cruel and callous, but what I learned here is shocking! I had frankly never thought about the fact that male calves are of no use to the dairy industry and were therefore “harvested” for veal or simply destroyed. So much for the fable of the “laughing cow” or “California Happy Cows.” I naively believed that dairy cows probably lived out their lifespan — especially “organic” cows. I know now that they frequently suffer and in the best of cases, the cows meet their fate in a slaughter house at a young age. I also never had the slightest notion of how cheese was created or aged. Thanks for another stellar article, Steve! People ar fussing around some ppm (parts per million) of animal derived enzyme in cheese but do not care for 250 to 350 grams of dead cow going together with every kg of cheese!!!!! What really astonishes me is that despite about only 2-3% vegetarians in the worlds poulation, only 20% Muslims and less than 0,5% Jews all excellent and natural products ought to be suddenly Vegetarian, Halal and Kosher suitable. This is just overruling the wide mayority of more than 75% of the population. This is also neglecting any organic or back to nature movement. By the way: the GMO product is no longer produced by the use of calf genes but by using Camel genes. The microbially derived product deliverys due to unspecific proteolysis bitter taste in cheese and lower yield. This is even confirmed now by Christian Hansen the producer of the Camel derived Chymosin as well as microbial coagulants (Hanilase). Milk an cheese were never vegetarian and will never be. There ought to be a human way to treat the animals as we have it here is Austria in the alps – if I look out of my window I can see milk cows on the meadows. A salami is a salami – possibly directly from Italy or from Hungary – no Vegetarian or Halal or Kosher suitable copy could ever substitute an original salami. A Bavarian Weisswurst (white saussage) is the same – a unique original and so is it with original Camembert or original Parmigiano or any other traditional cheese. Hi! I’ve been following your web site for a while now and finally got the bravery to go ahead and give you a shout out from New Caney Texas! Just wanted to mention keep up the good work! I have really loved surfing around your weblog posts. In any case I will be subscribing for your rss feed and I’m hoping you write once more very soon! Really great article! Thank you!!! what I eat. It’s true- ignorance is bliss, but a small sacrifice in the big picture. Thank you for your article – really good information.